Afternoon tea. As an avid coffee drinker with more sense than money, the concept of paying a significant amount of money for a handful of cakes and teas never really appealed to me. Mainly because such a thing is far too dainty for the likes of a rugged, masculine neanderthal like myself (or so I like to believe. Shut it. Let me live my delusions in peace). Tea itself, rarely appeals to me for that matter, save for occasions where the only “coffee” option is Nescafe (a dirty word), or the occasional evening cup after a big family dinner. But, when Steak came across a voucher for afternoon tea at Urban Meadow Cafe, I thought I’d give it a go and see what women and couples across Britain have been ranting and raving about for generations. (Probably quite a lot to be honest). 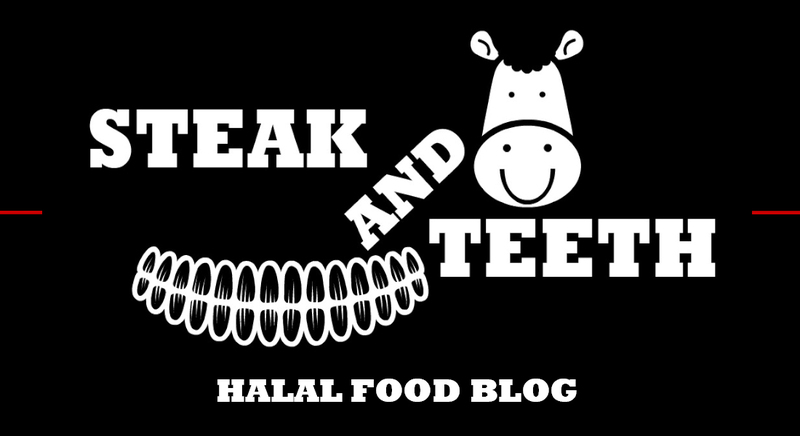 Note, the chicken/meat here isn’t halal, so be sure to specify that you would like vegetarian or pescatarian sandwich options when booking. After being welcomed and seated, we were given the menu and told we could order any of the teas or coffees we’d like – and in unlimited volumes at that. “Great!” I thought, I can turn my afternoon tea into an afternoon coffee – that’s always an upgrade. (Sorry tea lovers). 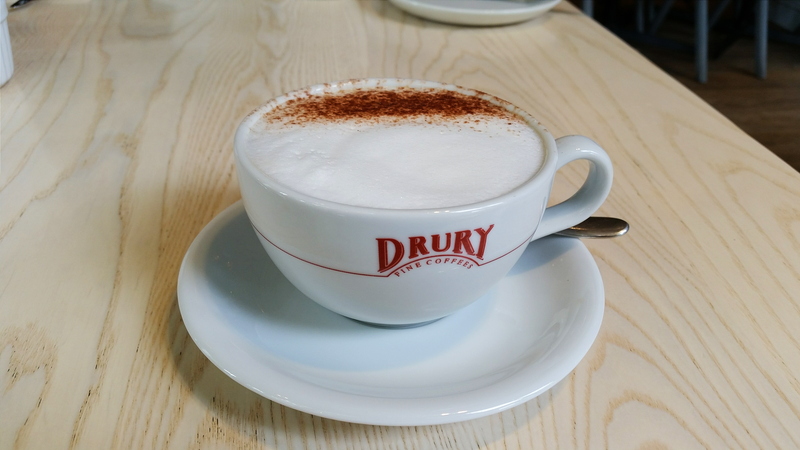 A cappuccino swiftly arrived to the table, bearing a thick layer of a light, velvety foam, with a (very) light dusting of cocoa powder. Sadly however, the coffee itself was extremely thin, light, and weak, and lacked any presence whatsoever. 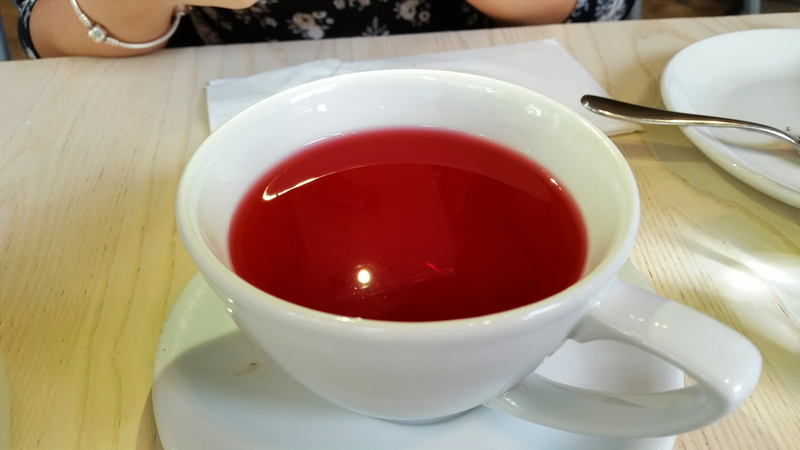 Poisoning your system with caffeine should be worth the taste of the poison, and after finding Urban Meadow’s coffee to be decidedly unworthy, I abandoned ship altogether and swam for the tea boat – it would be afternoon tea after all. 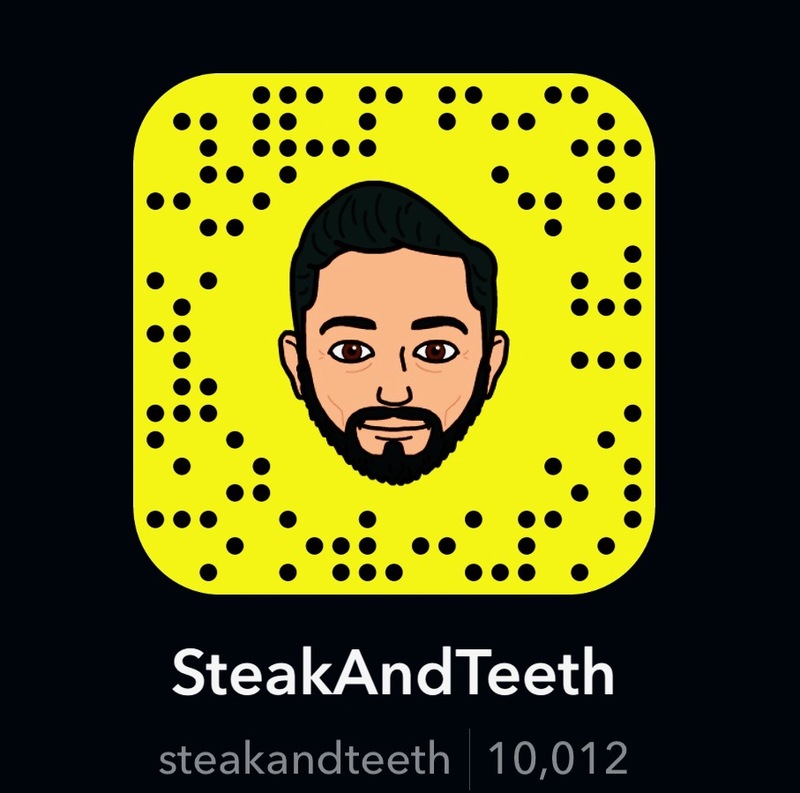 I dived straight into Steak’s teapot of vibrantly-coloured red berry blend (not literally of course, food bloggers are never that slim). 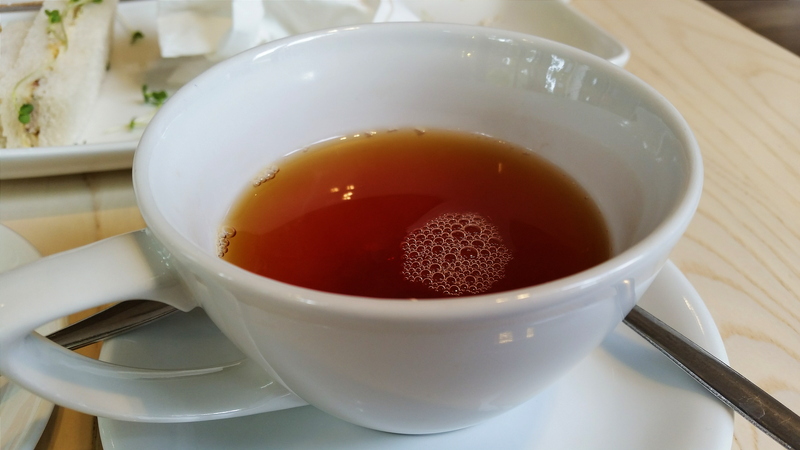 Though it does not appear to be so, this caffeine-free tea was incredibly light with no hint of sweetness, and as a result, was pleasantly refreshing. Possessing nothing but a subtle tang, it was complemented well by the chocolate cake that came as part of our platter. (More on the cakes in the food heading). With my empty cup of disappointing cappuccino hanging it’s head in shame, and the red berry teapot running on empty, we decided to order a pot of British breakfast tea to go hand in hand with the victoria sponge cakes and scones. This was of course, a risky move, considering many British/English teas in many British cafes consist of a single feeble teabag floating in a volume of water equivalent to that of the Atlantic ocean, resulting in a brew that’s as uselessly diluted as a bottle of homeopathic medicine. However, on this occasion, the english tea was served in a more sensible ratio, and after letting the pot brew for an extra minute or so, we poured away. To our pleasure, we discovered the breakfast tea to be wonderfully well-balanced and flavoursome, with a smooth tone and a good strength. A true testament to British tea leaves. Or err, rather, Kenyan, Sri Lankan, and Indian tea leaves according to the menu’s rather amusing description of “tea in the finest British tradition!”. (Awkward colonial turtle). By this stage, my adenosine receptors were well and truly blocked, and there was a level thrumming in my brain as it fired happily on all cylinders. Just one more tea then, before I pushed it into caffeine overdrive. 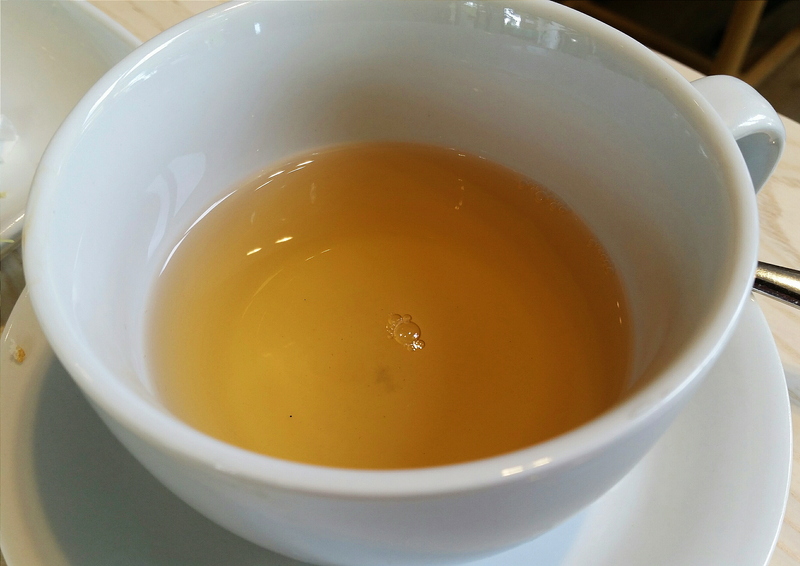 We opted for a Pa Mu Tan China white tea, which kicked up a strong aroma as soon as we removed the teapot cover. I found this tea to be rather light, with a mild lemon-like undertone. It also had a very earthy presence, which was a nice, cleansing finale to our afternoon of tea-binging. The food component of our afternoon tea consisted of a platter of sandwiches and high quality cakes and desserts. 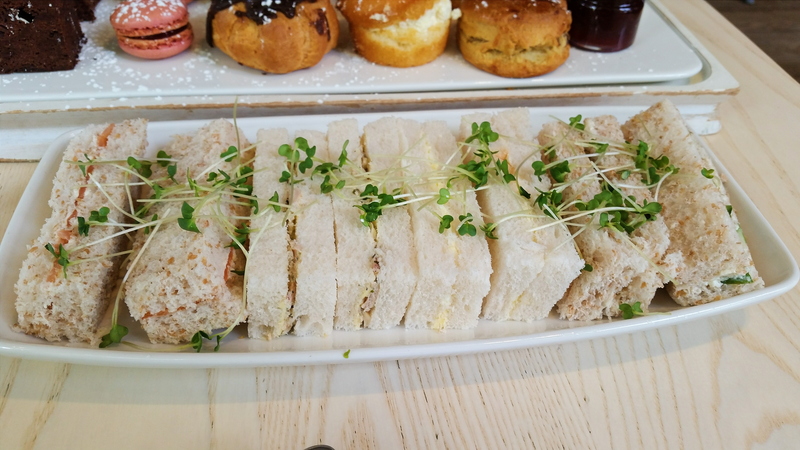 The sandwiches included strongly flavoured smoked salmon and dill cream cheese, cucumber and sour cream and chives, and egg mayo fillings amongst soft, airy bread. But of course, you’re not here to read about simple sandwiches, so let’s focus on the sweet stuff. The desserts were lined up back to back, in single file for each person on either end of the table, like a sinister execution line where we were the firing squad. We decidedly to sadistically pick each one off one by one, from one end to the other whilst the others watched in horror at the sight of the gigantic black hole attached to my face. First to meet its bitter end was the chocolate cake, which had a suitably subtle bitter tone and a rich buttercream topping. It was a soft, light cake with a mild sweetness that was not too rich or overbearing like most chocolate cakes. Next to go was the odd one out of the group – the raspberry macaroon. With a markedly pink coat, dusted in icing sugar, it was camouflaged amongst the cakes like a dolphin in a goldfish bowl. This ninja-school dropout carried a crispy, crunchy outer texture which contrasted greatly with the sticky texture of the filling, and delivered a sharp fruity sweetness. 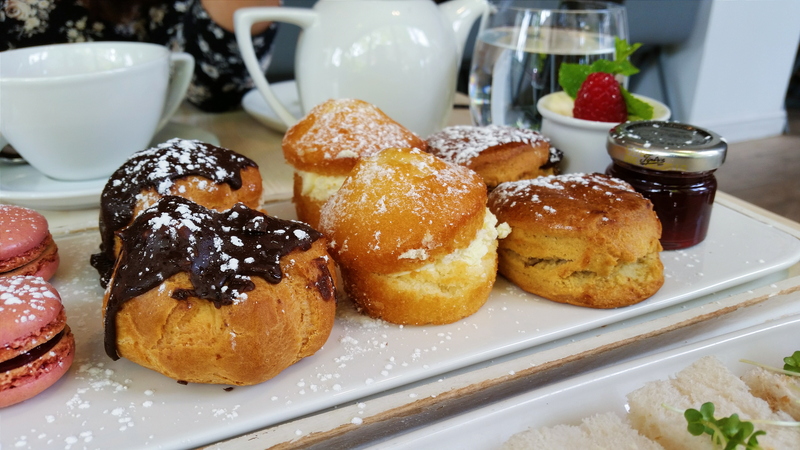 The profiterole next door consisted of a very light and soft casing, with an even lighter, airy cream filling within. This contrasted well with a hard, crisp, solidified dark chocolate covering (as opposed to a soft or liquid sauce covering usually found on profiteroles). This chocolate was sweet with a slightly bitter undertone, which contrasted well with the neutral taste of the cream filling. Next up were the hallmarks of a British afternoon tea. The Victoria sponge cakes were extremely light and airy, melting instantly in the mouth whilst meshing into the equally light and airy cream, and sticky sweet jam. These were one of my favourites amongst the selection, though Steak wasn’t a great fan, so I took it upon myself to have both. Her loss, my gain. (On the bathroom scales). The scones had a crisply baked outer surface, with a softer, mildly sweet centre, which were complemented well by the accompanying thick clotted cream and sticky sweet jam. A great, fat-filled finale, and one that’s extremely difficult to get wrong. Normally, the cost of afternoon tea at most establishments range in the region of £25-£40 per person, alongside a tribute of gold encrusted diamonds, a kidney, and your first born child. Luckily for us, Steak picked up a “Wowcher” voucher that entitled us both to the entire affair for £20 in total. If this was the regular price, it would of course, have thrown the value for money score well through the ceiling score of 5. 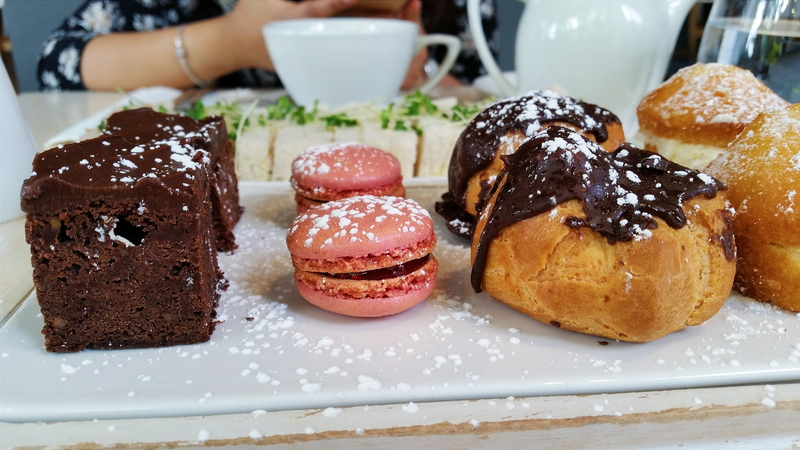 Even without the voucher however, afternoon tea for two at Urban Meadow costs £20 per person, which is a very reasonable price by usual afternoon tea standards (which isn’t saying a lot to be honest – usual standards are almost always extortionate). Despite a lack of savoury items aside from the sandwiches, you still receive an unlimited supply of tea and coffee, and a plentiful helping of sweet items, which are of a high quality, and incredibly filling. Staff are incredibly friendly, warm, polite, and welcoming. Service is prompt and efficient, and you’re unlikely to be left lost or forgotten when your teapot runs empty. Mainly because in a British cafe, if you leave a customer’s teapot empty, you could be sued for negligence and grievous bodily harm. 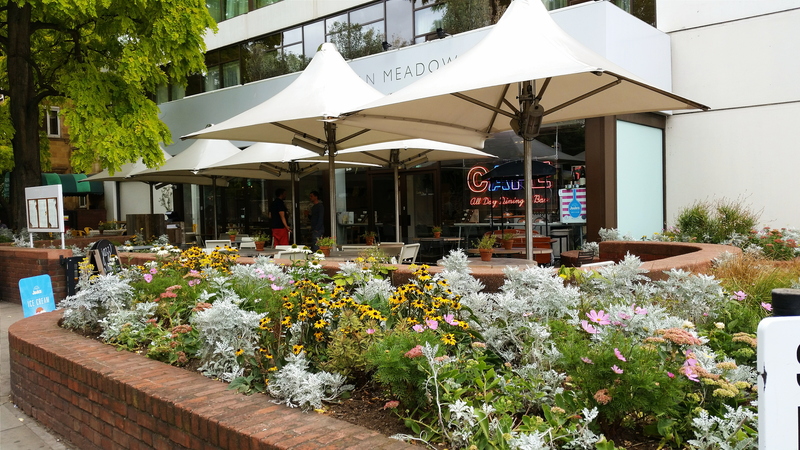 Urban Meadow Cafe is a fairly large cafe attached to the “Double Tree by Hilton” hotel, overlooking the relatively quiet, far northwestern corner of Hyde park. It boasts an attractive-looking outdoor seating area (or at least, potentially attractive when the sun comes out), with fabric sofa seats, wooden tables, and garden umbrellas – the pinnacle of British summer-optimism. 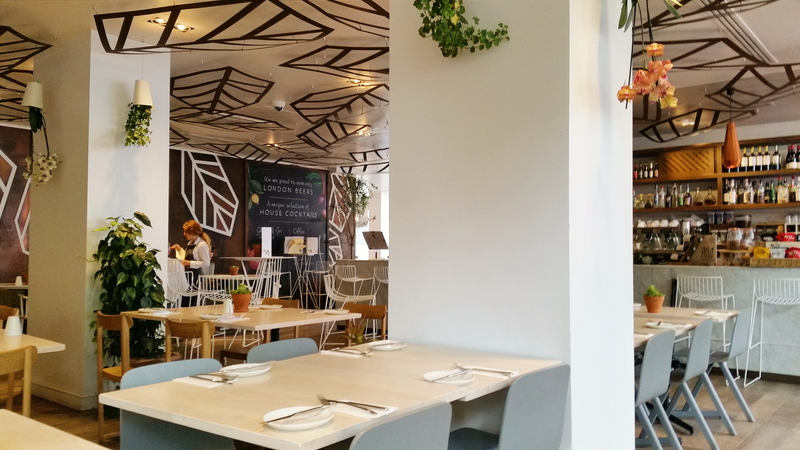 The interior decor is simple and naturalistic, with plain white walls carrying the odd leaf-patterned mural, pillars adorning shrubbery, light wooden flooring and simple furniture, as well as leaf-shaped fixtures hanging from the ceiling. As a result, it has a very cosy, earthy feel to it. Though that can be a little concerning too, as you’re never really sure if there’s a vegan hiding nearby, waiting to attack you with a carton of soya milk. The cafe is a brief five minute walk from Queensway station. There are a few places to park a car nearby, but you’re probably better off visiting by public transport. The confines of Urban Meadow’s spacious and leafy interior are a relatively quiet and peaceful place. Like a hippy’s garden, the whole place feels airy and relaxed, making it easy to unwind both your mind and your stomach, as you stuff the latter with tea and sugar. Afternoon tea. A legal and delicious method of daylight robbery. Whilst I still consider afternoon teas to be unnecessarily costly simply because they can be, I have to be bold, bite my tongue, and say that I actually rather enjoyed my first experience of it. Urban Meadow cafe offers a satisfying selection of victims for a sweet tooth, and whilst their coffee leaves very little to be desired, they offer a plentiful selection of soothing teas to make up for it. Whilst I’m certainly no “afternoon tea expert”, I can say that Urban Meadow cafe provides a (relatively) cheap and cheerful afternoon tea experience. They’ve somewhat expanded my willingness to try afternoon tea at other venues, and that’s dangerous territory indeed for both my finances, and my egotistical masculine pride.